Dawn Eye Openers: Vanilla Scented Fruity Breakfast Pots - Simply Fahad-istic! "This is my breakfast: Two poached eggs,turkey bacon,and a half avocado.The yolks in a poached egg are alkalizing.Avocados are a great source of fat and vitamin E;great for your skin.It's super light and not too heavy.Sometimes I like a little sweet as well,so I have a cup of plain yogurt with blueberries." For those days of yogurt and berries,I have a recipe!Vanilla Scented Fruity Breakfast Pots - seriously thick,creamy yogurt is mixed with fresh,fruit & berry puree and satiny cream. Scented with vanilla,it is baked in individual portions until the tops are slightly set(Like that of a custard.) ,but underneath is still flowing and luscious goodness! can chill overnight in the fridge,and also you would not have to do a thing in the morning! There couldn't have been a better recipe this National Dairy Month! Did you know?June is National Dairy Month! Depending upon whether you use homemade or store bought curd(Rule of thumb: Remember that homemade curd gives a lesser yield of hung curd since it has more moisture than the store bought variety.) ,if store bought,what brand,and the duration of time for which it is suspended,the yield of hung curd will greatly vary.Nonetheless,we will be using 1/4 cup/2 fl oz/60 ml of hung curd for this recipe. Ensure that all the ingredients are at room temperature before you start. Combine the hung curd along with vanilla extract and sweetened condensed milk in a bowl.Beat with a wire whisk until smooth and creamy.There should be no lumps whatsoever.A faster and easier way to do this is by first making the curd pass through a strainer,or even a cloth. (You may very well use the same cloth that was used to hang the curd.) Don't use an electric blender,or it will thin down the consistency.Keep aside. Now,put the chopped fruit in a blender and blend to a fine puree. 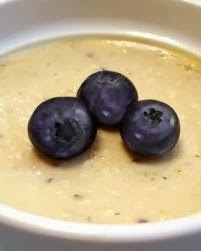 Pour this fruit puree into the bowl with the sweetened curd,along with the cream.Beat until everything is harmoniously combined.Once again,use a wire whisk,since you don't want to thin the curd in the mixture.Check for sweetness and add some more condensed milk,if required. 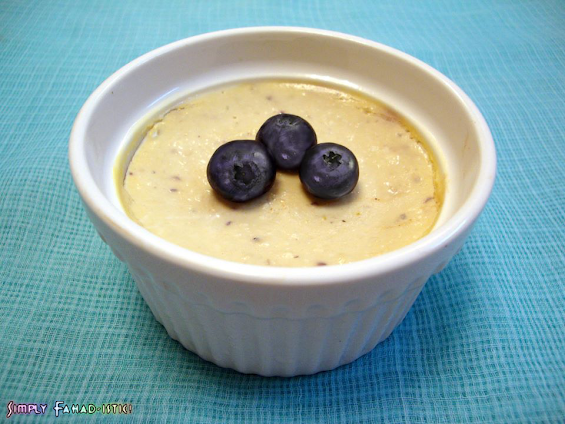 Transfer the contents of the bowl to one to four ramekin(s),depending upon their size. (Volume of ramekins ranges from 50 to 250 ml.) Place the ramekin(s) in an oven,and switch it on,at 140 degrees C/275 degrees F/Gas 1.The oven should not be pre-heated! Let the ramekin(s) stay in the oven for 7-10 minutes,during which the tops will set slightly,but the underneath will still have desirable,flowing,voluptuous yogurt.Take out the ramekin(s) .Sweet and reassuring perfume of vanilla will fill your kitchen. Allow the Vanilla Scented Fruity Breakfast Pots to cool down to room temperature,then refrigerate until serving time.Serve cold with a scattering of fresh blueberries or strawberry slices. 1. If you like,add some passionfruit in the chopped fruit mix. 2. The oven is not to be pre-heated since subjecting the curd to a sudden rise in temperature/high heat can cause curdling.This is also the reason why all ingredients are required to be at room temperature before starting. Substitute the chopped fruit entirely with mango,and the vanilla extract with 1/4 teaspoon of green cardamom powder and a small pinch of saffron.Serve as a dessert. And I love the variation too! Can't wait to try it! Thank you for such simple, easy to follow and delicious recipes!! Can't wait for your next post!